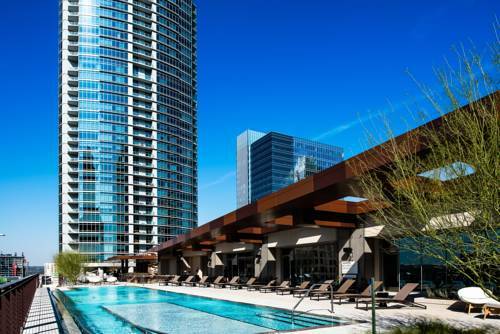 The JW Marriott Austin hotel brings an unparalleled upscale hotel to downtown Austin. Situated in the heart of the city, our hotel in Austin, TX is just a 15-minute drive from Austin International Airport. Here, you'll experience the quiet luxury of a JW Marriott hotel with 1,012 elegant, oversized guest rooms, countless amenities and a superior location near some of the best attractions and entertainment options Austin has to offer including the Sixth Street Entertainment District, South by Southwest Music Conference and Festival, Austin City Limits Music Festival, University of Texas and the Texas State Capitol. This Austin hotel features more than 120,000 square feet of flexible meeting and event space and easy access to the Austin Convention Center just two blocks away. And both business and leisure travelers alike will appreciate the variety of on-site restaurants, extensive state-of-the-art fitness center, outdoor pool deck and Cabanas and brand new Spa by JW! A full-service Austin Italian restaurant featuring authentic, regional Italian cuisine served in a warm, comfortable setting. Flavors of Texas focusing on regional ingredients, crafted tequila cocktails and locally sourced brews at this Austin restaurant. America's favorite purveyor of coffee and tea specialties is available to start your morning or for a welcome break during the day! Relax and socialize at our welcoming Lobby Bar - now offering late night Happy Hour Specials Sunday - Thursday from 7pm-9pm! The perfect place to grab a drink while relaxing by the rooftop pool. Open 11am to sundown. Featuring New Poolside Cabanas!